See the installation manual or, if you have already downloaded Borg, docs/installation.rst to get started with Borg. To deduplicate, all the chunks in the same repository are considered, no matter whether they come from different machines, from previous backups, from the same backup or even from the same single file. 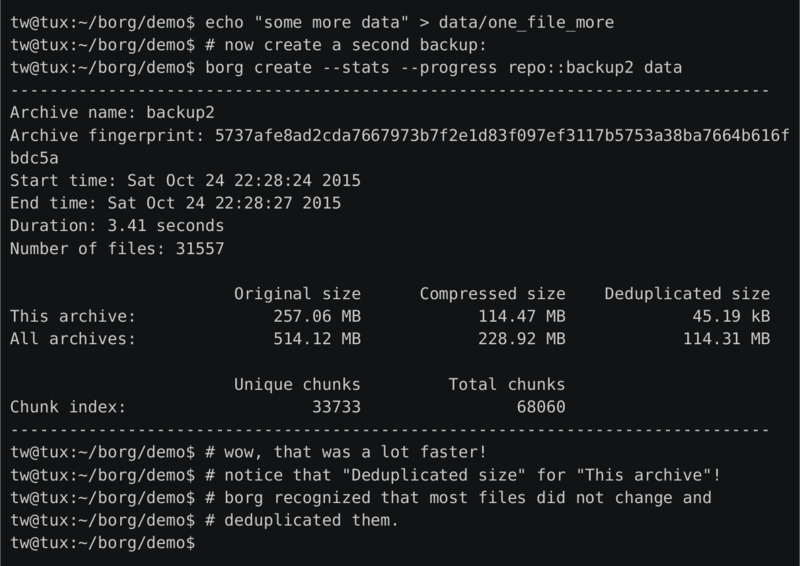 So you can move your stuff around without killing the deduplication, even between machines sharing a repo. If a big file changes a little, only a few new chunks will be stored - this is great for VMs or raw disks. Stuff may get shifted and will still be found by the deduplication algorithm. All data can be compressed by lz4 (super fast, low compression), zlib (medium speed and compression) or lzma (low speed, high compression). Borg can store data on any remote host accessible over SSH. If Borg is installed on the remote host, big performance gains can be achieved compared to using a network filesystem (sshfs, nfs, ...). Backup archives are mountable as userspace filesystems for easy interactive backup examination and restores (e.g. by using a regular file manager). This archive:          57.16 MB           46.78 MB            151.67 kB  <--- ! For a graphical frontend refer to our complementary project BorgWeb. Borg is a fork of Attic and maintained by “The Borg collective”. Please read the ChangeLog (or CHANGES.rst in the source distribution) for more information. BORG IS NOT COMPATIBLE WITH ORIGINAL ATTIC (but there is a one-way conversion). EXPECT THAT WE WILL BREAK COMPATIBILITY REPEATEDLY WHEN MAJOR RELEASE NUMBER CHANGES (like when going from 0.x.y to 1.0.0). NOT RELEASED DEVELOPMENT VERSIONS HAVE UNKNOWN COMPATIBILITY PROPERTIES. THIS IS SOFTWARE IN DEVELOPMENT, DECIDE YOURSELF WHETHER IT FITS YOUR NEEDS. Borg is distributed under a 3-clause BSD license, see License for the complete license. Can I backup VM disk images? Can I backup from multiple servers into a single repository? Which file types, attributes, etc. are preserved? Which file types, attributes, etc. are not preserved? Why is my backup bigger than with attic? Why doesn’t Borg do compression by default? How can I specify the encryption passphrase programmatically? When backing up to remote encrypted repos, is encryption done locally? When backing up to remote servers, do I have to trust the remote server? If a backup stops mid-way, does the already-backed-up data stay there? If it crashes with a UnicodeError, what can I do? I can’t extract non-ascii filenames by giving them on the commandline!? Can Borg add redundancy to the backup data to deal with hardware malfunction? Can Borg verify data integrity of a backup archive? I am seeing ‘A’ (added) status for a unchanged file!? Why was Borg forked from Attic?